These were the soul-searching words of Bishop Humphrey Erumaka, the Founder and General Overseer of Wordbase Assembly, Okota, Lagos, as he explored the question of leadership in his church during the launch of three new books he had written bringing his total authorship tally to fifteen books. The new books are: Assurance of Heaven By Grace, God At My Confused Junction and Accurate Leadership. 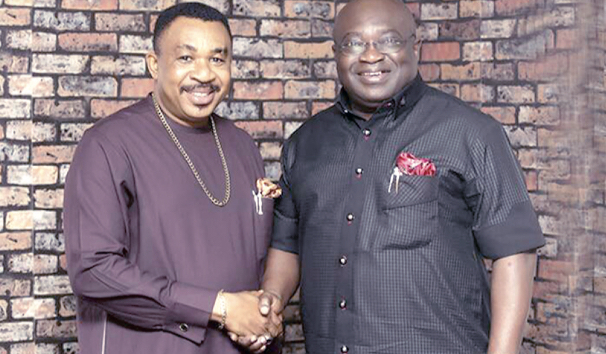 But then the man of God wasn’t just singling out Governor Ikpeazu. Like those prophets of old, he was simply telling everybody in the position of leadership, be you are a political leader, a corporate leader, a church leader or a leader even in the household to take leadership seriously. His theme this morning is “If only you were here,” chosen from John 11:21 where an anguished Martha said to Jesus: “Lord, if only you were here, my brother would not have died.” From that biblical text, Erumaka, like the captain of a ship took his congregation on a leadership cruise, a historical journey into the past and present where the great deeds of dead heroes were remembered. Erumaka in his book simplifies leadership using an acronym. To him, the “L” in leadership means Ladder. “A leader is a ladder. People must climb on you to get to the next level,” he says, adding that “Don’t be offended when they use you as a ladder and dump you afterwards.” The “D” means Driver. “A leader is a driver. A driver knows the way. As a driver, no matter the provocation, your leg must still be on the throttle and your hands on the steering. You must keep your cool.” Other acronyms are explained in the book. whom he prophesied as “future governors and senators.” He also promised to assist in finding solution to the malfunctioning church generator that couldn’t even make the governor enjoy air conditioning during the crowded church service that brought together Abia citizens in Lagos there to welcome their governor. For the members of Wordbase Assembly and their bishop, it’s one Sunday they would remember as the day a member of their church who became governor in fulfilment of Bishop Erumaka’s long-ago prophecy that a member of his church would return one day to the church crowned as governor. True to the prophecy, the governor returned to be a blessing to the church and left with a promise to do more for God and country. I suspect my wife, she’s too active!